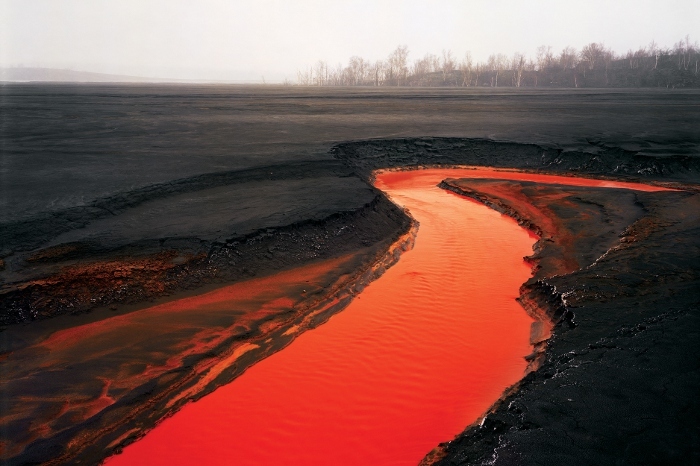 Jennifer Baichwal's Manufactured Landscapes (2006) is a slow-burning documentary that focuses on striking large-format industrial images by Canadian photographer Edward Burtynsky. Baichwal combines these images with footage shot at the original locations, which results in a sobering "exhibit in motion". 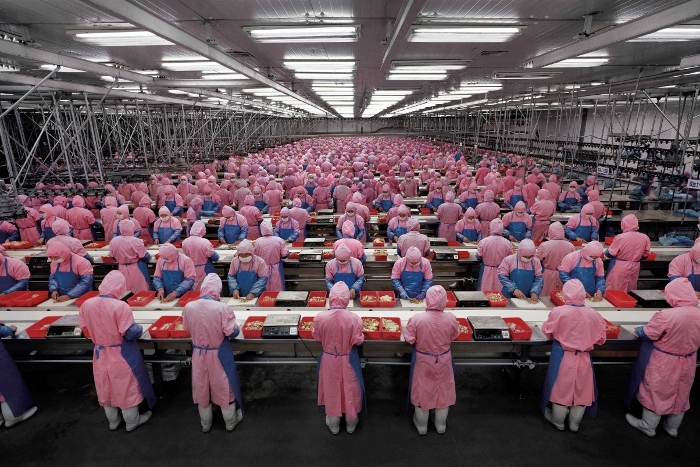 Burtynsky's photos often show us manufacturing plants and the people directly affected by them---and though the initial idea came to Burtynsky in Pennsylvania more than 25 years ago, he's developed a more international perspective in the decades since. More often than not, Manufactured Landscapes focuses its attention on China's sprawling factories and the enormous Three Gorges Dam near Yangtze River. These factories set the pulverizing tone for Baichwal's documentary; during its eight-minute opening sequence, a camera pans across the massive factory floor in a single, unbroken shot. The scope of the workers' production is evident but never explained in detail; more than anything else, it simply shows consumers how their frivolous consumables are made. Workers are lined up like cattle outside, disciplined by supervisors for allowing faulty products to slip through the cracks. Scavengers extract valuable metal fragments from discarded computer parts. A young woman assembles an electrical accessory at blistering speed, happily reporting that she'll be able to make hundreds more during a standard work day. It's not always the driving message, but Manufactured Landscapes reminds us that our actions directly influence the planet. Scenes filmed at Three Gorges Dam, the massive structure that required millions of citizens to move their homes, mostly show the impact of its construction; during the initial release of water, Earth's rotation was momentarily affected (and on a related note, the fully functional dam was finally completed earlier this year). Luckily, points like these are driven home without the use of heavy-handed scare tactics; in fact, the documentary is nearly dialogue-free, save for a handful of comments from Burtynsky and several of the affected Chinese locals. Overall, Manufactured Landscapes creates an engaging atmosphere for new audiences and, to its credit, has held up quite well to repeat viewings. This new Blu-Ray from Zeitgeist Video arrives five years after the Canadian and domestic DVD releases. It features the expected sheen of 1080p (which really improves the static shots of Burtynsky's photos), but a few notable supplements don't seem to have made the cut. Let's take a closer look, shall we? 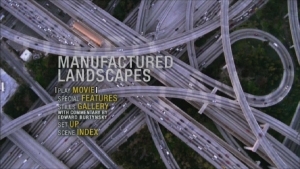 Once again presented in its original 1.78:1 aspect ratio, this 1080p transfer of Manufactured Landscapes offers a pleasing visual upgrade from the 2007 DVD releases. Burtynsky's photos benefit the most from the increased resolution, displaying crisp textures, strong levels of detail and accurate colors. Baichwal's on-location footage is of slightly lesser quality overall, but this seems to be a source material issue and nothing more. Digital eyesores like interlacing, edge enhancement and the dreaded DNR don't seem to be an issue at all. The bottom line is that the DVDs looked quite good and this Blu-Ray looks even better. Viewers should be thoroughly pleased whether they've seen the standard definition releases or not. Surprisingly enough for a documentary, this DTS-HD 5.1 Master Audio track offers a pleasing amount of rear channel activity and directional effects. Manufactured Landscapes really isn't a dialogue-driven film, so the clips of massive production plants and the Three Gorges Dam represent perfect examples of letting the locations speak louder than words. Optional French subtitles have been included during the main feature only, though burnt-in English subtitles occasionally appear for translation purposes. The menu designs are smooth and easy to navigate...but unlike the disc packagine, they're presented in French and English. This one-disc release is housed in a standard Blu-Ray keepcase with attractive double-sided artwork that replicates the Canadian and domestic DVD covers. No inserts are included. The main highlight is a collection of six Extended Scenes (39:22 total), including "Diana Lu's Extended House Tour", "Karaoke Bar in Qiligang", "Extended Old Shanghai Walkabout", "Stone Cutter Interview", "TED Conference - Monterey, California" and "Wushan". 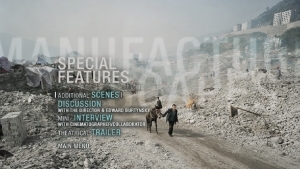 Up next are two Interviews conducted by Richard Goddard; the first is with Baichwal and Burtynsky (19:04), while the second features cinematographer and collaborator Peter Mettler (5:19). Both are fairly dry and some information is repeated from other extras, but they're still worth a look. Closing things out is the film's Theatrical Trailer (2:02). All bonus features are presented in standard definition and, unfortunately, do not include optional subtitles. In addition to missing extended scene commentary by Jennifer Baichwal, this release also omits a terrific gallery of Burtynsky photos with commentary by the artist, as well as footage of Al Gore at one of the film festival premieres (though his quite adorns the front cover). These missing extras were present on either the Canadian or domestic DVDs, so it's unknown why they didn't make the cut. Disappointing! 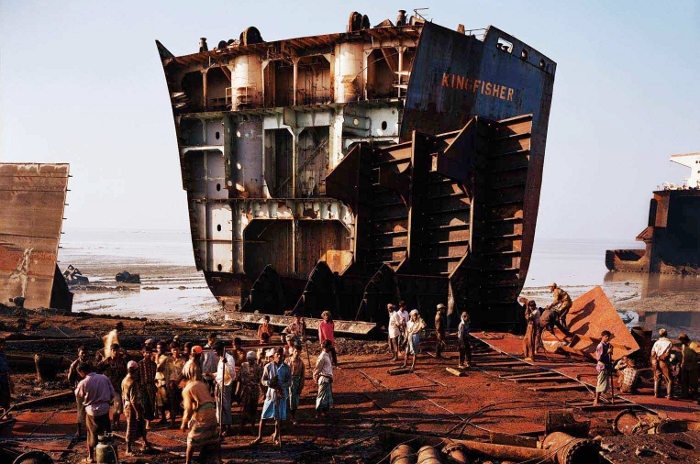 Deliberate but not preachy, Manufactured Landscapes is a sobering account of global industrialization. Photographer Edward Burtynsky's images are detailed and memorable, reminding us that we affect the planet as much as the planet affects us. Zeitgeist Video's Blu-Ray offers a partial upgrade from the 2007 DVD, serving up a strong A/V presentation but sacrificing a few choice DVD supplements in the process. While Manufactured Landscapes may only reach a select audience, those who enjoy forward-thinking documentaries shouldn't be disappointed in the least. Recommended, especially to first-time viewers.